Scalloped Potatoes made with sliced potatoes, cream, and butter are the perfect side dish for the holidays or to bring to a potluck! 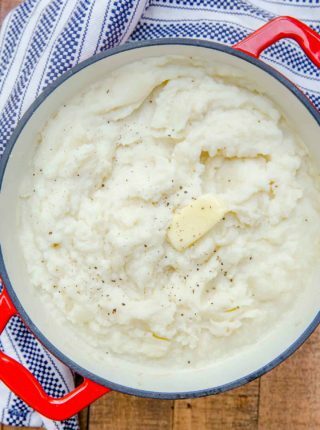 We know the secret to a great meal is in the side dishes you serve, and potatoes are always a winner in this area. Serve these scalloped potatoes with Perfect Easy Ribeye Steak, Oven Baked Pork Chops, or Ultimate Garlic Pork Loin Roast. Scalloped Potatoes are the perfect creamy side dish to serve alongside the main course, especially when the holidays come around. We’ve served these for both Christmas and Easter Dinner every year for as long as I can remember because they’re always a HUGE hit. Plus my youngest loves helping me layer the potato slices in the dish, making cooking a family activity. Technically scalloped potatoes don’t usually have cheese, but I like to add just a little bit of cheddar cheese on top for flavor and color. I usually prep this and refrigerate ahead of time, so when it’s time for dinner the next day it just goes straight into the oven. Potatoes Au Gratin are more indulgent and use thinner sliced potatoes arranged in a shallow baking dish. It usually has a cheese sauce made from gruyere or cheddar, nutmeg, and cream, similar tasting to a bechamel sauce. 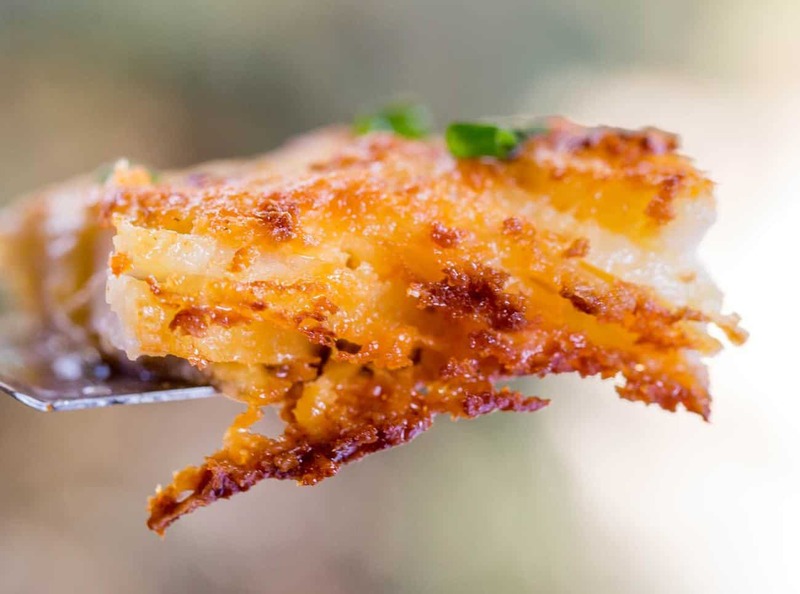 Scalloped potatoes recipe traditionally don’t require any cheese and are more simple to make, but you can add cheese if you’re in the mood for cheesy scalloped potatoes. WHAT ELSE CAN YOU ADD TO SCALLOPED POTATOES? I’ve made this scalloped potatoes recipe with ham, chives, or bacon. 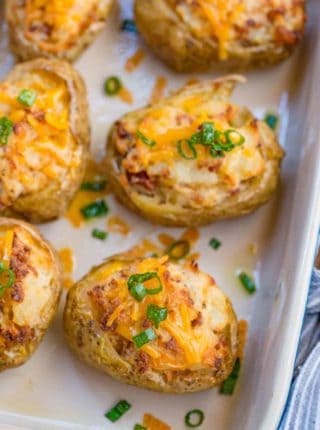 Anything that goes well with normal baked potatoes will match the flavors in this recipe. Top with grated parmesan cheese, cheddar cheese, or mozzarella. You can also sneak some veggies in this side dish. Try diced cauliflower, or really thin cut peeled zucchini between the potato slices. WHAT KIND OF POTATOES ARE USED FOR SCALLOPED POTATOES? Traditionally, scalloped potatoes recipes use russets because they hold up to the baking better than others. You can also use Yukon gold potatoes if that’s what you have. If I make this with Yukon potatoes I don’t bother peeling them. Try making another version of this recipe with sweet potatoes. Slice them thinly and layer, then add cinnamon and brown sugar to the saucepan before pouring it over the potatoes. Once it’s out of the oven, top with mini marshmallows. It’s like a scalloped sweet potato casserole! The potatoes should be cut thinly and evenly, about 1/8-inch-thick to 1/4-inch-thick. I use a mandolin slicer to make sure they’re all the same size and cook evenly. If you’re using a mandolin, russet potatoes are a little bit easier to use because they’re typically bigger than other varieties. WHY ARE MY SCALLOPED POTATOES STILL HARD? Your potatoes may be sliced too thick, and you’ll just need extra cooking time. If the top is burning, carefully cover the dish with tinfoil until the potatoes are soft. Another reason may be that your oven temperature is off, and you need to turn the heat higher. You can find this out with a basic oven thermometer to check against the set temperature. CAN YOU MAKE SCALLOPED POTATOES AHEAD OF TIME? These can be made ahead of time by just preparing the entire casserole, covering tightly, and refrigerating for up to 1-2 days. Then bake before serving. The oven should melt everything so it stays creamy, you can add a splash of milk if needed. 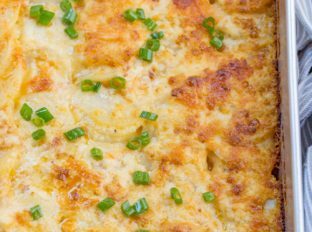 CAN YOU FREEZE SCALLOPED POTATOES BEFORE BAKING? Making this casserole according to directions, then before the baking step tightly wrap the baking dish and freeze. Defrost in the refrigerator prior to baking. If I’m going to do this, I usually get some disposable catering dishes so I don’t lose a casserole dish to the freezer for any time. Cooked scalloped potatoes will last 3-5 days in the refrigerator. Make sure you cover them tightly to help keep their creamy quality. I love serving this on the holidays, especially on Christmas or for Easter dinner, because the pattern looks really decorative on the table. Sprinkle the top with a little bit of cheese and broil for 2-3 minutes to add a really nice golden brown color on top. It might take a few minutes of whisking to get your sauce to thicken. After you add milk to the flour and butter, bring your sauce to a boil then lower it to a simmer to prevent burning. When adding the flour to the melted butter, whisk until the flour has browned and smells slightly nutty, then add the milk. This gives the creamy sauce a really nice rich flavor. Whisk continuously so the milk doesn’t curdle. You can make this dish gluten free by using cup for cup gluten free all purpose flour in place of the regular flour. Mince your onions in the food processor to cut down on time. If you don’t want to use cream, you can use half and half to help lighten up the recipe and save calories. Lay the potatoes one on top of each other in rows with half the salt and the minced onions. In a pot, add the butter on medium heat until melted, then add the flour, pepper, and remaining salt, whisking well for 30-45 seconds. Add in the milk and heavy cream slowly while whisking until thickened, about 2-3 minutes. Add the cream sauce over the potatoes and cook uncovered in the oven for 90 minutes. 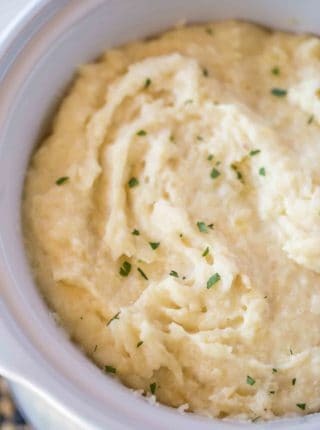 Made these potatoes to jazzy up St Patty’s Day dinner along with the cabbage steak and slow cooked corned beef recipes, also found on this site. They were all a big hit, especially these potatoes!! The cheese on top made the dish delectable! I didn’t have whole milk in the house, so used heavy cream and low-fat half and half. Came out extra rich, but still delicious! Making it again for friends tonight and using the low-fat half and half with the whole milk this time to see the difference. I’m sure will be just as delicious!! Fantastic! So glad you enjoyed it. This looks delicious. I would like to thicken with cornstarch instead of flour. How much cornstarch should I use? I would recommend cutting the amount in half if using cornstarch. Good luck! Wonderful texture and taste! I make this as a side with your KFC copycat recipe. My family loved it and I will make it again. I definitely would recommend your website to everyone! One of the very best! So sweet of you to say! I’m so glad you’re loving the site! 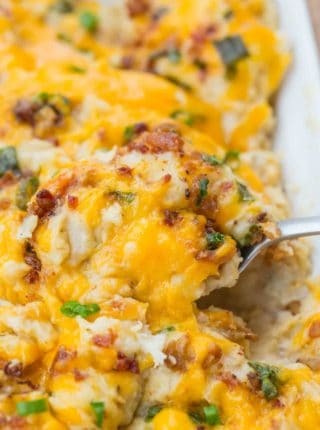 What size dish do you put this scalloped potato recipe in to bake? Is this recipe for an 8×8 pan? I need to double recipe for large family. Looks amazing! I will be doing a gluten free version. This was made in 9×13 pan. I hope you enjoy it! Could you prepare the day before and do the cooking the next day? I probably wouldn’t do that. The potatoes could turn color on you. Looks incredibly delicious! I bet those flavors are amazing, need to try this soon! Scalloped potatoes is a favorite around here. The addition of cheese makes it irresistible! 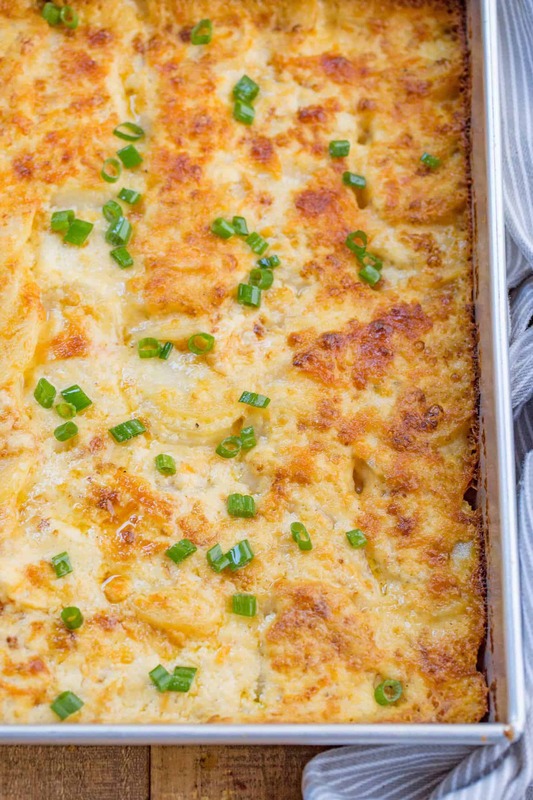 These scalloped potatoes are the ultimate comfort food side dish! So perfect for the Christmas dinner menu! So great for the holidays! You can never have too many potato options! I could eat scalloped potatoes every day! These look just perfect! My family absolutely loved them! Thank you for such an easy recipe. Can you make this a day ahead, refrigerate & reheat next day? If so, how long to reheat? Looks yummy! Tnx! Cover it with foil and reheat in a 350 degree oven for 25-30 minutes. So tasty! I salt to taste. So glad you enjoyed it! Thanks for the 5 stars! Our house loves au gratin, but we might need to try this out!